Keeler's Needle is the splendid chunk of granite next over from Mt Whitney. It is well over 14,000 feet, but it is not considered a 'peak' (weird, eh? it looks pretty 'peaked' to me). Next to it is Day Needle, which is also nice to look at (and hard to climb from this side). 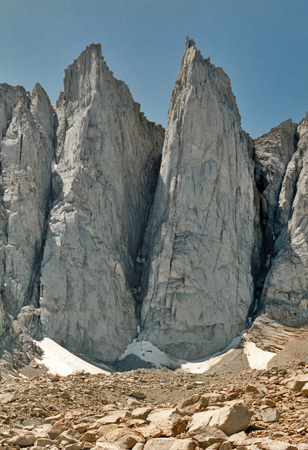 These are considered to be part of the south ridge of Mt Whitney.